It is almost impossible to rate these relentlessly hip books – they are pure marmite*. The huge Introducing … series (a vast range of books covering everything from Quantum Theory to Islam), previously known as … for Beginners, puts across the message in a style that owes as much to Terry Gilliam and pop art as it does to popular science. Pretty well every page features large graphics with speech bubbles that are supposed to emphasise the point. Funnily, Introducing Artificial Intelligence is both a good and bad example of the series. Let’s get the bad bits out of the way first. The illustrators of these books are very variable, and I didn’t particularly like the pictures here. They did add something – the illustrations in these books always have a lot of information content, rather than being window dressing – but they seemed more detached from the text and rather lacking in the oomph the best versions have. The other real problem is that this is a book that really should have been updated. It was written in 2003 and though all but the last few pages are spot on in terms of content, clearly things have moved on in the last few years. We are introduced to something called the Sony Dream Robot, clearly the predecessor of Asimo – but in the predictions of one Hans Morovec that basic menial humanoid robots would be common by 2010, we see the classic divide between academic and real world. It just doesn’t make economic sense. And remarkable though Asimo was, it was extremely expensive to build and still has major limitations. However, limitations aside, the book was brilliant at getting across the basics of AI and managing to pack a huge amount of information into this pocket-sized volume. It’s by no means all about robotics, with large chunks of the philosophy and nature of cognition, and the different mechanisms and approaches proposed for AI. I was briefly in charge of the AI group at British Airways and I thought the book represented well the hope, occasional value but general lack of usefulness of AI, which contrasted well with similar books on chaos theory which dwell on their applications without pointing out that they are largely unfulfilled. There were some old friends here like Alan Turing and the Turing test, and John Searle’s ‘Chinese room’ where someone appears to pass the Turing test by communicating in written Chinese using a large set of rules without ever being able to speak Chinese, demonstrating that the ability to mimic this kind of mental process isn’t the same as the process itself. You will get your mind in the occasional twist, but there’s a lot of meat in this text for such a small book. 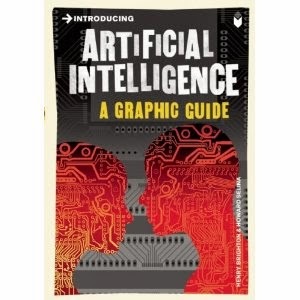 Overall, then, very worthwhile as an introduction to AI, provided you aren’t too disappointed by the out of date nature of the last few pages – and like the best of these books, fun along the way.